H to the izz-O...V to the izz-A...will be headline Friday night at the APW festival. 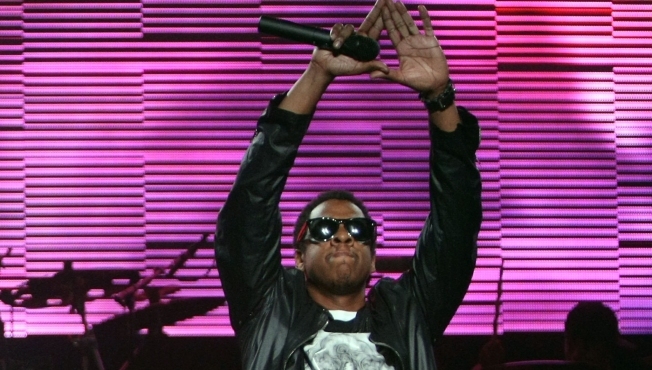 Jay-Z will make his U.S. festival debut in Dirty Jerzy next weekend, headlining the All Points West Music & Arts Festival as he steps in after the Beastie Boys were forced to cancel their opening night appearance on July 31. The trio scrapped their current schedule because Adam Yauch must undergo surgery and treatment for a cancerous tumor in his salivary gland. The three-day festival at Liberty State Park in Jersey City also features Tool on Saturday night, Coldplay on Sunday and more than 65 artists. Jay-Z will headline the Friday show that includes the National, Fleet Foxes, MSTRKRFT, Q-Tip, The Pharcyde, Organized Konfusion,The Knux, Ra Ra Riot, Seasick Steve, Telepathe, Shearwater, Heartless Bastards, Xavier Rudd, Flying Lotus, Carolina Liar, Peanut Butter Wolf, CollegeHumor Live, Arj Barker, Eugene Mirman, and Bo Burnham.